Let’s talk chocolate chip cookies shall we? 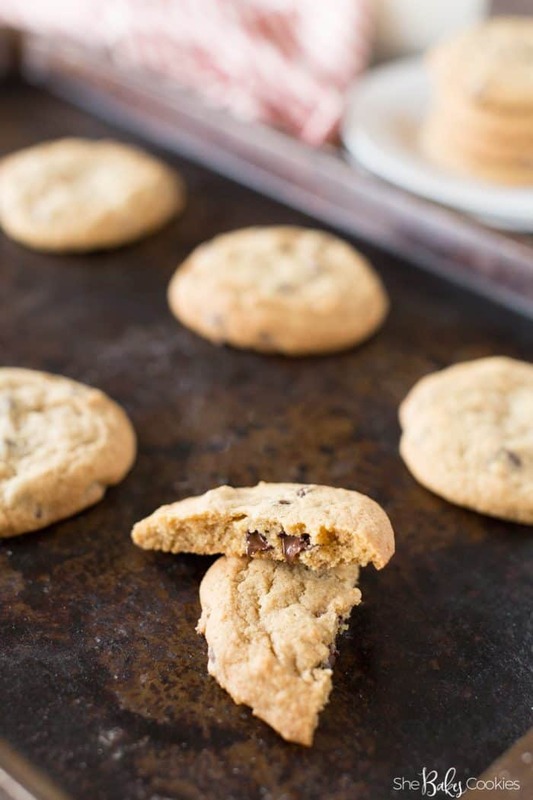 These are the very best jumbo chocolate chip cookies that you’ll ever taste! And who doesn’t love jumbo chocolate chip cookies?! Hi friends! 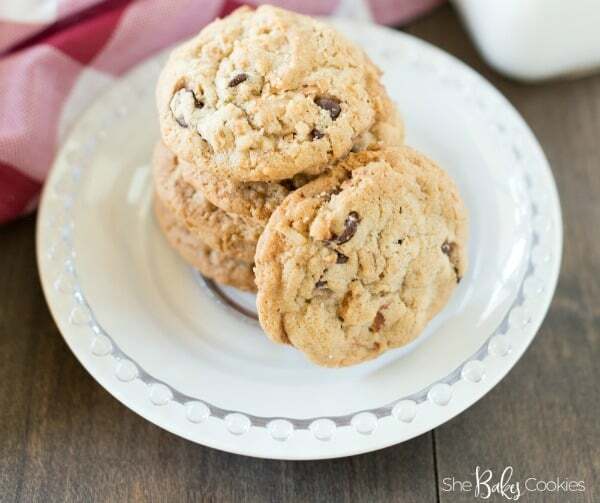 Kristine, from She Bakes Cookies again with one of my all-time favorite cookie recipes for you – jumbo chocolate chip cookies! I don’t know if I told you, but we have two girls, both of whom are teenagers now (…I can’t believe it). They both grew up loving cookies (thank goodness! ), so I’ve always been a cookie baker; but like every other busy mom on earth, my time was limited, so over the years I’ve perfected a small-batch, one-bowl recipe that makes thick and chewy jumbo chocolate chip cookies! The whole recipe makes 14 big cookies, which seems to be the perfect amount! 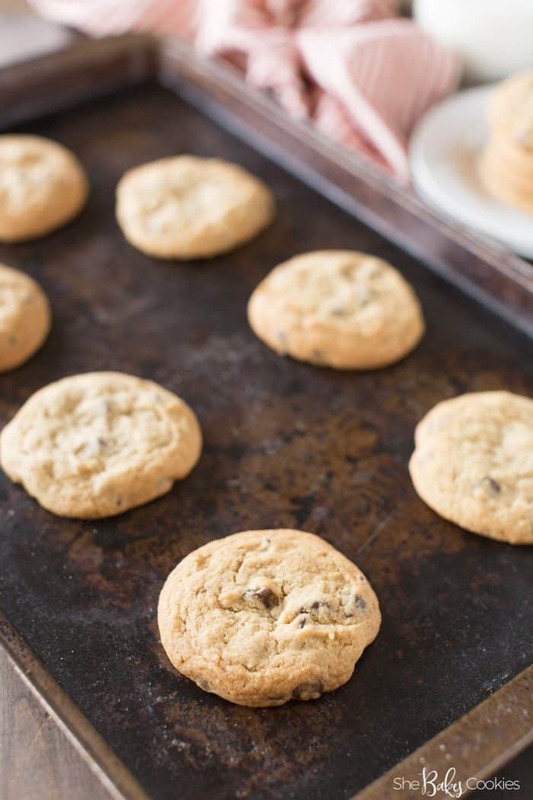 What makes this jumbo chocolate chip cookies recipe the best? This recipe only takes a few minutes to whip up, 10 to be exact! It doesn’t require any kitchen equipment, besides a mixing bowl, a large spoon, and some baking sheets. It uses everyday baking ingredients too, nothing special required here; so these are THE perfect everyday jumbo chocolate chip cookies! You don’t end up with dozens and dozens of cookies. 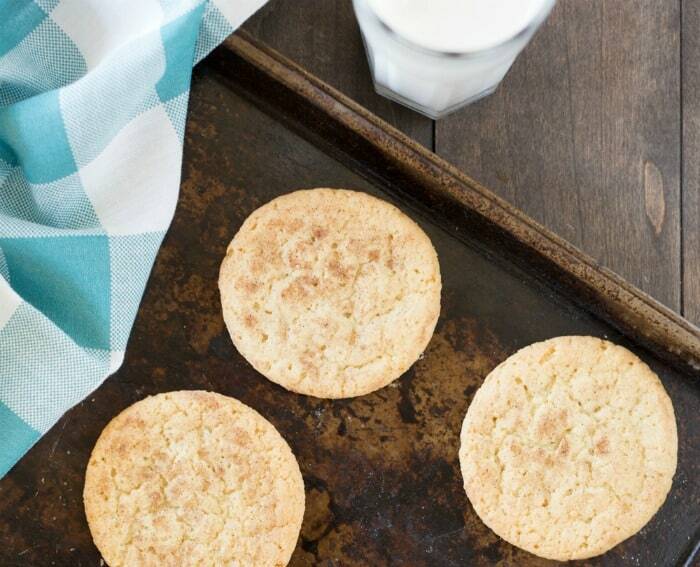 You can easily customize the recipe to change up the cookies! If you you’re a fan of sprinkles, check out my sprinkle chocolate chip cookies, they’re very similar and I know you’ll love them too! Because the jumbo chocolate chip cookies are made with mostly brown sugar, they’re super chewy, but the edges brown up perfectly for that added crunch around the outside, which might be my favorite part! And just so you know, the recipe calls for a MINIMUM of 1/2 cup chocolate chips, but don’t feel limited by this number! I’ve added much more (up to 1 cup or even more) and it only makes the jumbo chocolate chip cookies better – trust me. Try it for yourself and see! 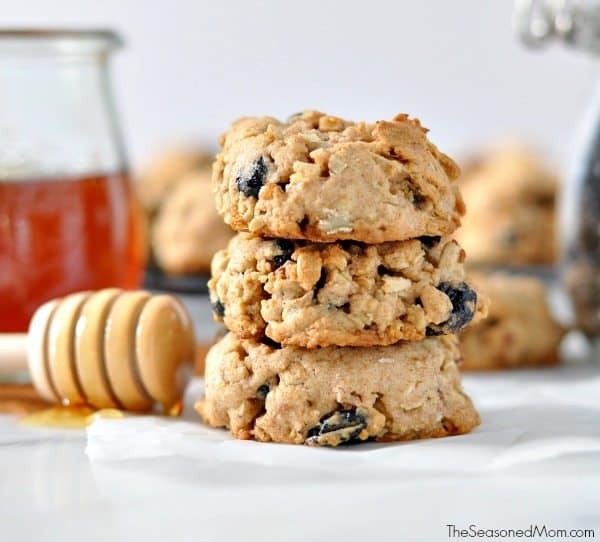 And if you’re a cookie aficionado looking for ways to jazz up these jumbo chocolate chip cookies, try throwing in 1/4 to 1/2 cup chopped pecans or walnuts and take these babies to a whole new level! Peanut butter lovers, try adding add 1/2 cup peanut butter chips to get that famous peanut butter and chocolate combo. 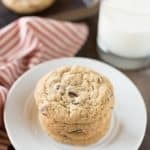 White chocolate lovers, add 1/2 cup white chocolate chips or if you’re really brave, omit the chocolate chips and add just 1 cup of white chocolate chips for an all white cookie. The possibilities are endless! Whether you have them plain or with added goodies, it doesn’t matter – these jumbo chocolate chip cookies will quickly become a favorite! Let me know how you make this recipe yours; what’s your favorite? 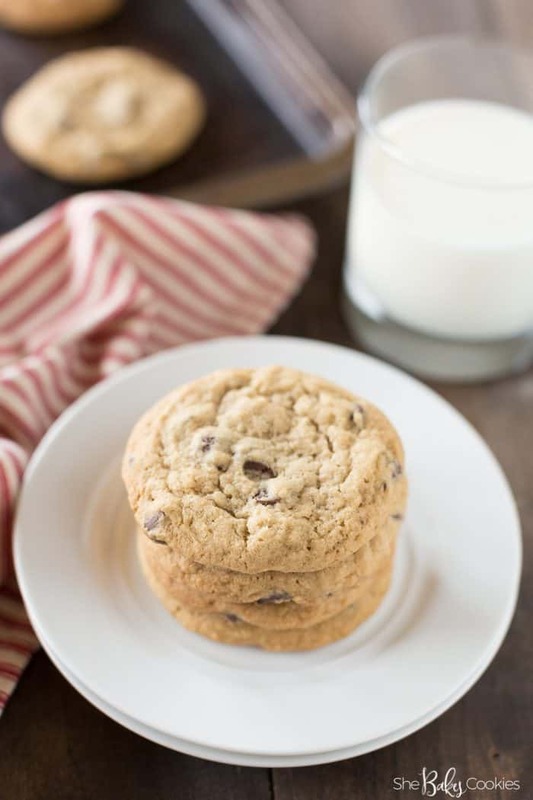 Chewy jumbo chocolate chip cookies are the ultimate cookie recipe that no one will be able to resist. In a large bowl, cream butter and sugars together until smooth. Add sea salt and baking soda and stir. Mix in egg, water, and vanilla until smooth. Slowly add flour, half at a time and stir until fully combined. Scoop dough with a large cookie scoop (2 TBS) and place on a lined cookie sheet 2 inches apart. Bake for 12-14 minutes, rotating halfway through. Cool on cookie sheet for 5 minutes before transferring to a wire rack. *I only get 6 cookies per baking sheet. **Recipe may be doubled to make more cookies. From left to right: Healthy Trail Mix Cookies, Coconut Chocolate Chip Cookies & Easy Snickerdoodle Recipe.